John Bruton | On March 2, British Prime Minister Theresa May delivered a key speech on the United Kingdom’s future relationship with the European Union. My first reaction was that the UK is going to put itself and other EU countries through a lot of trouble just so it can leave the union and then rejoin it in selected areas. The UK wants a partnership with the European Union on customs, state aid and competition, transport, energy, broadcasting, financial services, atomic power, aviation, the enforcement of court judgments and a long list of other fields. As an EU member today, the UK already has a partnership with the 27 countries of the union on all these things. This was worked out painstakingly over 45 years of UK membership of the EU. It now wants to tear that up and negotiate a new partnership on all these different questions. And it wants to get the job done within two years. All this is being done in the name of “taking back control,” but it appears that, in many areas, control is being taken back only to be given away again immediately. A lot of work for very little product! Just as Gordon Brown, the former prime minister and chancellor of the exchequer, had five “tests” for joining the euro, which were so loose that he could interpret them any way he liked, Theresa May has five tests for an acceptable Brexit outcome, which will mean different things to different people. In fact, they sounded more like the introduction to an election manifesto than a prism through which to measure the success of a negotiation on some of the most technical and specialist of legal topics. Her idea of a customs partnership to avoid a hard border in Ireland seems like a smuggler’s charter. 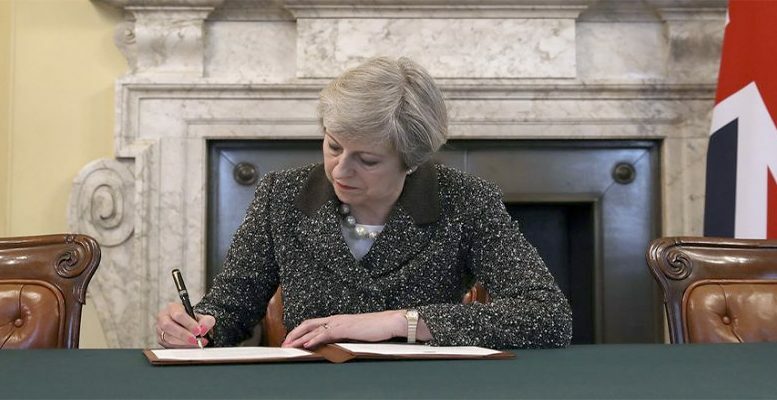 She envisages the UK having different tariffs on goods entering the country to the tariffs charged on goods entering the EU. That is the whole point of leaving the customs union. She then suggests the United Kingdom would charge the UK tariff on goods “intended” for the UK and the EU tariff on goods passing through Britain but “intended” for an EU country (most likely Ireland). In this way, May hopes no customs checks would be needed at the Irish border or in Irish ports. The scope for abuse and exchanging of goods seems to be unlimited here. Consignments could be substituted for one another, and there would be no check on them when they cross the Irish border. Such an arrangement would very difficult to police and is unlikely to satisfy the EU customs code. If the EU and the UK are to have different rates of tariff, her idea of exempting small businesses along the Irish border from any control at all seems like an invitation to smuggle. The most valuable test that May wishes to apply to a Brexit agreement is that it should be one that would endure and not require constant renegotiation. But she said things elsewhere in her speech that will make it very difficult to pass that test. She stressed that any trade agreement with the EU could be changed afterward by the British Parliament. That is a recipe for instability. At the moment, Parliament cannot overrule an EU ruling to which the UK had previously agreed. After Brexit, that would no longer be so and, as result, business would know that everything about any future UK-EU trade agreement would be subject to the vagaries of British politics. British politics has already forced the UK to renege on 45 years of treaty-based agreements with the EU. So, a mere trade agreement in the future will not be a solid base for investment. Every time that Parliament would try to go back on something in the agreement, there would have to be a new negotiation. Furthermore, May said that UK courts would not accept the decisions of the European Court of Justice (ECJ) on many disputed matters. The best she could say was that the UK courts would “look at” ECJ rulings before making their own decisions. This means that UK interpretations will gradually diverge from the standard EU/ECJ ones. When that happens, renegotiation will be inevitable. She advocated, instead of accepting ECJ jurisdiction, the idea of an “arbitration mechanism” that would be independent of the EU and the UK. That might work for a country that trades a limited number of products with the EU. But May herself said that she wants an agreement with the EU that would cover more subjects that any trade agreement anywhere else in the world. An arbitration mechanism, covering the vast range of the EU’s dealings with the UK, if it is to be truly independent, would soon become a rival to the ECJ. It could develop a different interpretative philosophy to the ECJ. That would undermine the common legal order of the EU and is unlikely to be accepted. One of the tests that May set for an acceptable Brexit was that it would strengthen the union between the four “nations” that make up the United Kingdom: England, Scotland, Wales and Northern Ireland. But the process of Brexit itself is having the opposite effect. In the way the referendum was set up, a majority of English and Welsh “leave” voters were allowed to overrule “remain” majorities in the two other “nations,” Scotland and Northern Ireland. The Brexit referendum of June 2016 was a crude exercise for English power to satisfy a purely English political agenda. There is growing dissatisfaction in the devolved assemblies, including in Wales, about the way Westminster is making decisions on EU-related matters that are the prerogative of the assemblies in Edinburgh, Cardiff and Belfast. It is good that Theresa May has, at last, got into some detail in her speech. This will have had some educational value for her party. But the text of the withdrawal treaty is not yet agreed, and that must be done before the substantive negotiation can begin. But the fact that the UK has not come up with a legal text of its own — to reflect the agreement that the prime minister made in December 2017 on the withdrawal treaty with EU negotiator Michel Barnier — but is still criticizing the EU version virulently shows that we have long way to go on this unproductive and time-wasting road to Brexit.